An ancient race of people with feathers for hair and magic running through their veins, another ancient race of people with the characteristics of dragons, an intelligent MC with a quick wit, an unlikely group of people on a quest for a mythical entity – what’s not to like? This book was such an enjoyable and gripping read. Although this author’s writing wasn’t the best I’ve come across, I really liked the style. The dialogue between the characters allowed their individual personalities to shine through – an excellent job of showing and not telling – and at times was very humorous and entertaining. Most chapters were from Echo’s POV, but some of the other characters had their turns also, and I appreciated seeing things from a different perspective. The group dynamics were especially enjoyable for me. The Avicen and Drakharin are taught from birth that they’re enemies – and yet some of them had to put those feelings and prejudices aside, learn to trust each other, and work together. I was disappointed to see yet another love triangle, but that almost seems to be a prerequisite in YA books anymore. Echo seemed to lose her ability to reason when she was around the two guys in the triangle, which I thought seemed a little inconsistent with her character because she has such a strong sense of self. I found it especially difficult to swallow that one of these characters, roughly 250 years old and supposedly much more mature, behaved more like a teenager than someone who had led troops into battle for decades. On the flip side of that, I was pleased to see the beginning of a possible relationship between two gay characters, the diversity a welcome change from most YA reads. If you like urban fantasy with some adventure thrown in and a healthy dose of humor, this is your book. 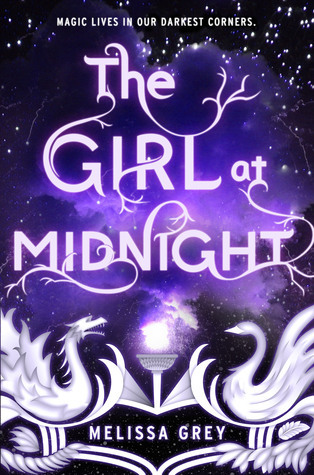 The Girl at Midnight is scheduled for publication April 28th, 2015. I should write a book called Love Triangle. It’ll be a million seller, lol. And you’ve just given an idea to a plethora of teenagers! lol, I wish them luck as I won’t ever get past chapter one in my writing!